FFA is not extracurricular! 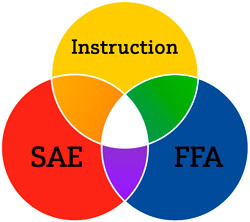 The program is part of a three-part model of education that consists of (1) classroom instruction, (2) supervised agricultural experiences and the (3) FFA. Classroom agricultural education is applied to hands-on learning opportunities called supervised agricultural experiences (SAEs). SAEs include activities such as starting a business, working for an established company or working in production agriculture. FFA activities vary greatly from chapter to chapter, but are based in a well-integrated curriculum. Chapter activities and programs concentrate on three areas of the FFA mission: premier leadership, personal growth and career success. The national FFA emblem, consisting of five symbols, is representative of the history, goals, and future of the organization. 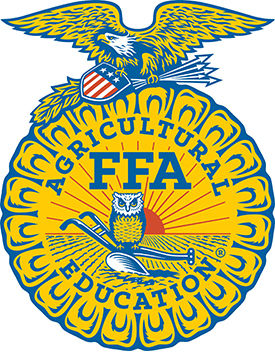 As a whole, the emblem covers the broad spectrum of FFA and agriculture. Each element within the emblem has unique significance. As the blue field of our nation's flag and the golden fields of ripened corn unify our country, the FFA colors of national blue and corn gold give unity to the organization. The Texas FFA Association was chartered in 1929. More than one-third of Texas FFA members are female. Ten state officers, high school seniors, are popularly elected annually by the delegates at the State FFA Convention. The state FFA president and first VP take a yearlong leave of absence from college to travel the state representing Texas FFA by visiting 400+ schools; traveling more than 60,000 miles.